Para mais dicas como esta, inscreva-se no nosso canal! 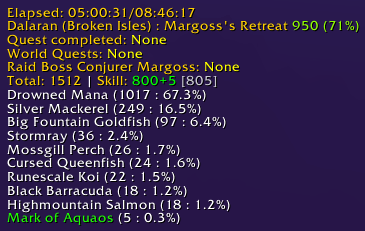 TIP #1: There are groups in the group-finder that fish together on Margoss' Retreat; this greatly increases the number of Marca de Aquaos that are fished up, and with enough people you can chain them back-to-back, increasing your rate of Mana Afogado acquisition dramatically! TIP #2: Take advantage of reputation buffs, like IUPI!/Cartola de Negraluna while the Darkmoon Faire is active, or similar buffs listed in the guide below during holidays to speed this grind up! Any race/class can use Ventos Esmeralda (Toy obtained from the achievement Filhote do Gadanho in Alta Montanha). Cartola de Negraluna is granted by the Cartola de Negraluna item, which can be purchased for 10 Cupom Premiado de Negralunas. 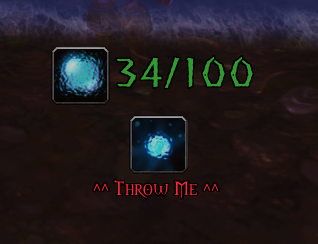 It can only be used while the Darkmoon Faire is active. IUPI! and Cartola de Negraluna do not stack with each other. *Each level of reputation requires just over 152 Mana Afogado with a single 10% buff. Stacking buffs will further the effectiveness. Battle Pet. Critter. Adds the Battle Pet Gualixim to your collection. Caixote de Flutuadores: Cabeça de Murloc and Caixote de Flutuadores: Patinho de Borracha - 599 Mana Afogado required for one, 699 Mana Afogado required for both. If you want to be able to get to him when you want, get the Pipa Chifre Celeste de Pena de Roca from Highmountain. Fast and easy to get. For druids with moonkin form trying to get to the island just use your Flap Ability: Tomo das Selvas: Bater Asas jumping off from the Battle Pet area in Dalaran. You'll land with plenty of time to spare and won't have the issues that you get from zoning if you try to use Pipa Chifre Celeste de Pena de Roca. As of 15/1/17, using Canoa dos Pescadores while on the small lake grants water walking instead of the raft showing up. Not sure if this is working as intended. The buff still shows as Anglers Fishing Raft though. Forgive me if this is old news, but I finally got this guy to best friend, and only after buying the Limpa-fundos Abissais d'Água Salgada did I realize that it requires Best Friend with him. Then I looked, and the two toys and the two pets also require some rep with him. SO, with that said, if you are planning on grinding this guy for toys/pets/mounts to share, be prepared to grind at least a little bit on your alts. He is located on a floating island just north of Dalaran in which is not on the tradiontal map. You can use Kit de Planador Goblínico or Emblema de Margoss to reach the island, unless you have flying. This will take anywhere from 3hours to 12hours+ depending on fishing drop rate of Mana Afogado and if you take no breaks. Marca de Aquaos is important as you throw it in and Aquaos, o Vertido will be summoned. Once he is killed there will be a 2minute buff for the area increasing the fishing drop rate of the Mana Afogado about 1-2 per cast at that point. That is why its crucial to find a party and immediately toss in Marca de Aquaos once you have it to gather resources faster. Once you reach Best-friends with Conjurador Margoss you will then need to exchange 100x Mana Afogado for Limpa-fundos Abissais d'Água Salgada. He also has other stuff like a pet you can buy with Mana Afogado. Um ex-aluno do Kirin Tor, Margoss passou a se dedicar à pesca para aliviar a sua vida estressante.